This solid piece is a smart and sleek addition to the living room in your home. Featuring a warm Cinnamon finish, an upper drawer for storage, and a lower shelf for display, metal knob hardware, and slate table top inserts, this rectangular end table is certain to be a lasting addition to the living room in your home. The Allister Rectangular End Table by Magnussen Home at AHFA in the area. Product availability may vary. Contact us for the most current availability on this product. Rich in texture and detailing, the Allister collection of living room accent table furniture brings more to the table, than most tables. 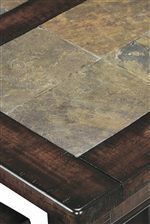 Crafted of Cherry veneers and designed with colorful slate inserts, all completed in a warm and inviting Cinnamon finish, the Allister collection combines functionality and modern styling. A perfect and smart functionality is found in the four pull-out stools found in the centerpiece cocktail table. The Allister collection is a great option if you are looking for Casual Mission furniture in the area. Browse other items in the Allister collection from AHFA in the area.